Use a hammer, not a 2x4! I love analogies. When someone is struggling to understand either a concept or how something applies, I find that an analogy using something with which they are familiar moves things along much faster. You are a builder constructing a house. You have all the tools you need to do the job properly in your tool bag and all the materials laid in front of you. However, each time you go to pound a nail, rather than searching through your tool bag for the hammer that you own and know how to use, you pick up the closest 2x4 and use that instead. After putting the nail into position, you whack it over and over with the 2x 4. Yes, the nail is driven in slightly, but it is all crooked and bent. Pulling it out, you start the very same process again, banging and banging away with the 2x 4 You aren't getting the results you want. You get frustrated and whip the 2 x 4 across the yard, saying that you can't drive the nail into the wood. You've worked hard and have sweat and exhaustion to prove it. However, the job has not been done. Once you settle down, you decide to search your tool bag and see the hammer. Using the hammer, you easily drive the nail into the wood. Had you taken the time to walk to your tool bag to get the hammer in the beginning, you could have driven the nail into the wood correctly the first time. Instead, you grabbed the first thing available to you because that was easier at first, but got frustrated in the process and ended up spending more time on the job. Wouldn't it be easier to just walk over to the tool bag and get the hammer first? After I explained this analogy, I could see the light go on. He's always in a rush and doesn't want to think about whatever task is before him. Instead, he whacks it with the nearest 2x4 in an attempt to just get the job done. In the end it takes much longer, because he has to redo his work. I can't say the analogy has entirely solved the problem. However, all I need to say is, "Are you using your hammer or a 2x4?" and he knows exactly what I mean. It gives a much clearer picture of my previous, "Think, child, think!" Do you have any analogies you use in your homeschool? If so, I'd love to hear them! Math. It is loved by some and loathed by others. Just today someone told me they didn't have a "math brain". Regardless, it is a subject that all students must learn and study. Those who seem to be wired to do math, still need to learn and practice, though they usually enjoy doing so! Those lacking the "math brain" may need some extra encouragement, but there is no reason why it can't be fun for them as well. Math is a subject of mastery, with each concept building upon the previous. To optimize learning, the student needs to be engaged during the learning and use concepts in a variety of ways in order to gain mastery. is a series of math software available by topic. Topics, which range from K-12, start at the beginning with whole numbers and continue through algebra. ...Unlike most math software, it goes beyond simple games, low-level operations or rule memorization to link familiar and concrete experiences to higher-level processes... Our goal is to provide students a foundation for analytical thinking in the modern world and for higher-level math and science. There are three different types of products available through Galaxy of Education. There are six different software programs covering a variety of topics and levels. Each costs $29.95 and is supplied on CD. Math Galaxy Whole Numbers Fun - (grades 1-4) With 16 topics total, covers all of whole number operations, including time, money, length, area, volume, pictographs, bar graphs and probability. Math Galaxy Fractions Fun - (grade 5) Over 14 topics covering equivalent fractions, comparing fractions, reducing fractions, improper fractions, prime factors, greatest common factor, LCM, adding, subtracting, multiplying, dividing, word problems, plus geometry, graphs and probability. Math Galaxy Decimals, Proportions, % Fun - (grade 6) Covers decimals, ratios and proportions, and percents concepts and operations, plus geometry, graphs, data analysis and probability with 30 topics total. Math Galaxy Word Problems Fun - (elementary and middle school) Sixteen topics cover whole numbers, fractions, decimals, multi-step problems, ratios & proportions, percents, negative numbers, time, length, area, volume, weight, angles and graphs & tables. Math Galaxy Pre-Algebra Fun - (middle school) Covers 33 pre-algebra topics and concepts, including order of operations, scientific notations, exponents, factors and more. Algebra Fundamentals - (middle school - high school) Thirty algebra topics including: negative numbers, 2-step equations, distance problems, coordinates & slopes, and more. In addition to problems with step-by-step answers, each of the above has games to solidify the concepts. Whole Numbers Fun, Fractions, Fun, and Decimals have four games: Word Jumbles, Riddles, Bridge the Swamp and Labyrinth. Pre-Algebra has the same games, minus Bridge the Swamp and Algebra has Labyrinth only. With the exception of one, the game-based Word Problems Fun, the software programs are a tutorial style, with detailed explanations for each problem. Users have a selection of problem types under the topic. Below you will find the home screen of the Pre-Algebra program. The Math Riddler, the worksheet generator program, is available for the following topics: whole numbers, fractions, decimals, and algebra. This program topic includes all of the riddle and worksheet topics from the software, an unlimited number of problems, and 500 riddles. Each worksheet generator program costs $29.95 and is supplied on a CD. E-books are available for whole numbers and fractions. The e-books come in PDF format and each include 130 of the 500 printable riddles and worksheets in the generator software. Each e-book is available for download for $14.95. When I first started exploring the various topics, I have to admit I started to misjudge the program based on the outdated graphics. The graphics had a bit of an 80s feel to them. They certainly were not sophisticated at all. Furthermore, there is no sound. But, just as you shouldn't judge a book by its cover, nor should you judge a software program by its graphics. At least, you shouldn't when the main objective is to teach math rather than simply entertain. After getting over my flashback, I discovered that the instruction is quite sound and thorough. I really liked the step-by-step answers provided. For students that are solid on the steps already, they can forgo the explanations and select to proceed in "answer only" mode. For example, the Negative Numbers selection on Algebra Fun has a review that consists of 18 screens of explanations and graphics. I found this quite in-depth for a basic algebra topic. Now, all of the topics didn't have a review and not all have as many screens. However, all the explanations all seem to be clear and sound. Once the student has reviewed negative numbers, they can continue on to answer three problem types -temperatures, word problems, and negative numbers - in either step-by-step or answer-only mode. Another feature I liked was the motivation to earn robots in order to play the Labyrinth maze, which happened to be my son's favorite game. Students can earn a robot for either each problem they complete in the step-by-step mode or each problem they answer correctly in the answer-only mode. Once they run out of robots, they are locked out of the game until they earn more robots. My daughter worked with the algebra software and my son the fractions. When I asked them what they liked the most, the both appreciated that you could earn robots to play the labyrinth game. My daughter mostly used the software as an extra practice tool for familiar topics and didn't rely on the step-by-step feature much. To get into the labyrinth quicker, my son did the same. However, I like that each topic is easily categorized and could easily be assigned, with full explanations, for weak areas. I don't always have time to get a step-by-step tutorial and this will be great for independent work while I'm occupied with another child. Aside from the graphics being a stumbling block for me, the fact that there is no sound has its pros and cons. For us, I liked that there was no sound because playing the game didn't disturb any children in the room that were trying to do other school work. Sound is simply not needed to use the software. However, reading is. My kids are 10 and 13. I wondered how this might impact the programs covering earlier concepts being used by children that aren't strong readers. Also, because we already have a lot of math software and products on our shelves, I personally might consider this product too costly given each program only covers one topic. However, each is covered quite thoroughly and can be used with multiple children. The value is hard to determine because it is based simply on how much the product will be used and how much your children will learn using it. See for yourself! If you would like to get an idea on how this product would work for your students, you can try out partial editions of the tutorials, games, riddles and worksheets at the Math Galaxy website. The software also comes with a 30-day money-back guarantee. Hair is a battle that I typically don't fight. My son's hair is thick and grows really fast (he didn't get it from his mother, let me tell 'ya!) and it quickly becomes unmanageable. I think he likes it that way (smile). Frankly, I kind of like it longer. It fits his personality quite well. Do you see that adorable smirk in the pic on the left? Regardless, my son's hair has been a major issue with his dad. His last cut a couple of months ago satisfied dad for a bit, but didn't fully resolve the problem. This time, Dad marched him to the barber for more than a trim. Now granted, my son was ready for a change, which is evident by the smile he produced after the fact. He really doesn't have to bother combing it and that is just about right for a 10-year-old boy. But, WOW, who is that kid? Normally, I do a Top 10 Things I've Learned This Week deal each Fit Mommy check in. I must have had a very flat learning curve this week. Or maybe I'm just being lazy. Either way, I can't think of 10 things I learned. The Top 5 Things just doesn't sound right. Maybe next week will be a better learning environment! Nutritionally, there was a bit of a turn around. Hubby said that he was wanting to eat a bit better. Now, if you are wondering why hubby's eating habits impact my eating habits, it all has to do with self control and when one has it. It is a simple. Now, I have great self-control at the store. I really don't buy a lot of junk, even chocolate! The hubby, however, brings chips, ice cream, and chocolate into the house and then leaves it with me, the glutenous wife, and my two growing helpers all day. A couple weeks later he'll remember that double chocolate ice cream he bought and go to scoop himself a bowl. Seriously - does he really expect that ice cream to be around? If hubby is on board with healthy eating, I have some hope. We'll see if he really means it. Even though we still have some junk around at the moment, I actually didn't rummage for chocolate, had a salad or two, and remembered vitamins most of the week. For exercise, I'm continuing to work out with the trampoline/rebounder. This week, I've turned the sound all the way off. It is so much tolerable that way, though Cheerleader Lady does still drive me nuts. Instead of CS Lewis, I've gone for music, requiring a little less of my attention, and have been listening to The Sparks, a Christian duo that performed at our church a few years back. I don't use my MP3 player much and I need to add some more music to it for next week. I never really times the length of the workout last week (and it wasn't listed on the DVD) and made a point to do so this week. It is almost 30 minutes exactly. I worked out Monday and Tuesday. Wednesday I woke up cranky with a cold my husband shared with me. I had trouble sleeping during the night and just wasn't up to working out. Thursday I was feeling a bit better and could probably have worked out, but decided to milk it a bit longer. Today I was back to working out in the morning, though I did stall quite a bit. Later, a friend is coming over to drop off something and we decided to hit the outdoors for a walk. I get some exercise while catching up with a friend - double duty! Next week I'm going to try for working out 5 days a week rather than my usual 3 days. Hopefully I'll have some good news for my check in next week. Dover is running a sale until Saturday, Mar 27. Save $20 on an online purchase of $40 or more. Just use Coupon Code Q2CS during checkout to take advantage of this special discount. What a great deal to stock up on Dover products. My mom always sticks the little Dover books in the kids' Christmas stockings and Easter baskets. They are also great to mail with birthday and holiday cards to children in the family. I came across this explanation of teens today, written almost 50 years ago. I've read it before, but had no teens in the house at the time. I just realized that while children are dogs—loyal and affectionate—teenagers are cats. It’s so easy to be a dog owner. You feed it, train it, boss it around. It puts its head on your knee and gazes at you as if you were a Rembrandt painting. It bounds indoors with enthusiasm when you call it. Then, around age 13, your adorable little puppy turns into a big old cat. When you tell it to come inside, it looks amazed, as if wondering who died and made you emperor. Instead of dogging your footsteps, it disappears. You won’t see it again until it gets hungry—then it pauses on its sprint through the kitchen long enough to turn its nose up at whatever you’re serving. When you reach out to ruffle its head, in that old affectionate gesture, it twists away from you, then gives you a blank stare, as if trying to remember where it has seen you before. Only now you’re dealing with a cat, so everything that worked before now produces the opposite of the desired results. Call it, and it runs away. Tell it to sit, and it jumps on the counter. The more you go toward it, wringing your hands, the more it moves away. Instead of continuing to act like a dog owner, you can learn to behave like a cat owner. Put a dish of food near the door, and let it come to you. But remember that a cat needs your help and your affection too. Sit still, and it will come, seeking that warm, comforting lap it has nor entirely forgotten. Be there to open the door for it. One day, you grown-up child will walk into the kitchen, give you a big kiss and say, “You’ve been on your feet all day. Let me get those dishes for you.” Then you’ll realize your cat is a dog again. I'm not sure a cat sums up my teen, though I do relate to the jumping up on counters (do I have the only teen that thinks counters are large, platform chairs?). I see a swan emerging and the free spirit of a horse galloping the field. Quite often, I see a happy lark. Other times I see an angry hornet and a stubborn mule. And, yes, I do believe I have a sloth on my hands when it comes to motivation for math! Yet, when it is something of interest, the sloth transforms to a cheetah that needs space to run at full force. Teens, in metamorphosis to adulthood, are too complicated to be summed up by one animal. Regardless, teenagers are a completely different animal from a young child, requiring a whole new approach to parenting. What about your teen? What animal is in your house? Many may be familiar with CBH Ministries, the producer of Our Daily Bread and Keys for Kids devotionals. With its beginnings in 1942, under the name of Children's Bible Hour, CBH Ministries is an international Christian ministry that shares the gospel of Jesus Christ through radio programs, print materials, and online media. See CBH's Statement of Faith here. CBH provided me with their new book series, Seasons of Faith, designed to encourage children to grow in their faith. Each title addresses a different "season" of faith development and teaches core truths of the Bible. Ecclesiastes 3:1, "To everything there is a season, a time for every purpose under heaven," is the inspiration for the title of this series. Race with Midnight (spring) -Will Becky share her faith with her cousin Sarah when she visits? Will Sarah listen? You Can't Come In (summer) - While building a fort, Adam shares his faith with his new friend Zack and invites him to church. Zack begins to understand why we need the gift of Jesus to cleanse us of our sins. Seventy Time Seven (fall) - After breaking the local ice cream shop's sign, Brad learns a hard lesson about forgiveness. Find out how Brad learns to extend forgiveness to his friends. Braving the Storm (winter) - Thomas doesn't understand why bad things are happening to him and his family. Follow along with Thomas as he learns that growing your faith deep in Jesus will help you weather the storms of life. All of these stories are adaptations of radio scripts from the classic Children's Bible Hour program. Included with each paperback is a read-along CD narrated by Uncle Charlie. Keeping with the focus of the ministry, every book has the ABCs of salvation (Admit, Believe, Choose) on the last page. There are also discussion questions available for each title. While CBH Ministries targets ages 6-12, these titles are picture books with full-page watercolor pictures on every other page. My guess is that the appeal will be for a more narrow age range, perhaps ages 6-8 or 9. I don't have any little ones to test drive these stories; my kids are long past the picture book stage. Instead, I read them myself with the target age group in mind. These are wholesome stories and remind me of something that would be in a Sunday school classroom environment. There is a very strong gospel message in each title, which is indeed the purpose of the story. However, the story lines are a bit unrealistic, which I struggled with some. The plot takes second to the message and overall is quite old-fashioned. Of course, these are adapted from dated scripts and the tone of the books very much reminds me of an old radio show. If you enjoy the Children's Bible Hour programs, this print version will likely appeal to you. My favorite title was Braving the Storm, simply because it deals with topics relevant to families today, e.g. financial issues and forced moves from homes. I also love that each title comes with a read-along CD, making it a perfect item to pull out for little ones when you need a bit of free time. Each title retails $10 each. Considering that these picture books also come with a CD, I found this a very reasonable price. Four more titles adapted from scripts are expected out by the end of the year. Visit CBH Ministries to learn more about the Seasons of Faith series as well as other products offered for sale and by donation. 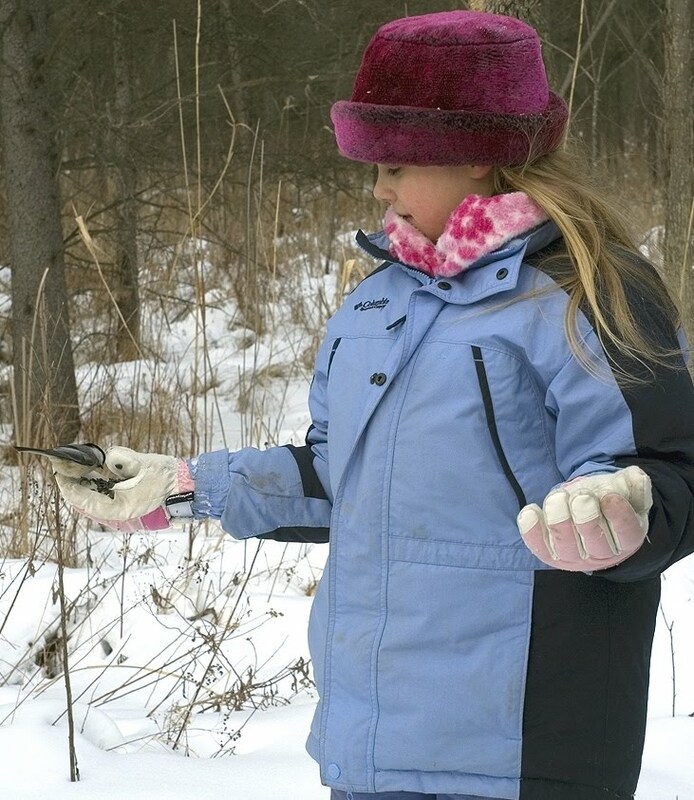 Not my work, but this is my daughter enjoying a hike on the nature trail. For those of you who haven't heard about the wild barn own named Molly, you can check out a live feed of her and her baby, Max, here. Four more eggs are yet to hatch. My kids and I keep checking back to see if she has another owlet; one is expected to hatch today. Excitement roars at our house at every move. "Look...she's standing up! Oh, look at the baby. I wonder when is she going to eat that rabbit?" The other day, we watched Molly swallow a rabbit whole. That was impressive. Yesterday, we watched her feed Max pieces of a mouse. Check Molly out if you get a chance. It sure beats what is on TV and is commercial-free. Be careful though, watching Molly is incredibly addicting. Help! How do I teach what I don't know? This week's Blog Cruise question is, "How do you teach advanced subjects?" Most homeschooling parents are rather comfortable teaching the younger years. When I was first exploring homeschooling for our family, part of my logic was, "Can I really mess up kindergarten?" Since that first year, I've tried to take each year as it comes. At 5th and 7th grade, my kids are already starting to hit material that I either never covered or don't remember. I handle such material in three ways: learn, relearn, or outsource. Homeschooling parents should be life-long learners. There is no reason why you can't learn right along with your child if they are covering material unfamiliar to you. In fact, what a wonderful example you can be to your child by modeling that there is always more to learn. There is never a time that you "arrive" and know it all. Depending on the subject and personality of your child, you can either work along side your child or work a few lessons in advance and stay just a step ahead. When questions come up, explore the answers together by going to the library or browsing the internet. Even though it may have been a long time, you'd be surprised at what you've likely retained from your school years. One subject that I often need a refresher in is math, even though I have an engineering degree and took advanced math in college. Though I haven't used higher levels of math in years, a quick look at the lesson usually brings it back. How you handle this again depends on the personality of your child. Make sure that your child has the maturity to understand that you as a teacher needing to refresh material already learned is not only ok, but often a necessary process when subject matter is not used on a regular basis. Once this is established, your student observing this process can be a valuable lesson in itself for your students. I don't want my children to expect that once they know a topic, it will forever come to them immediately or else they never really knew the material. However, you don't want your child losing confidence in you as a teacher and if they do not yet have the maturity to understand needing to refer back to the text for a refresher, make sure you do this in advance and are prepared to answers before they cover the material. For advanced subjects that you've taken in the past, either review lessons before your child gets to them (to present to dependent learners or be prepared for questions), looking up needed information, or tackle it as questions arise (for independent learners). Relearning is no different than learning the material, the process is just quicker because the foundation is already laid. b) I had no knowledge of the subject and wasn't willing to learn it in order to teach it. While I personally haven't felt there isn't a subject I can't learn, I have heard other parents say they "can't" teach a subject. I often think it is a confidence issue, but there may be a subject that is just too difficult for you personally to effectively teach or guide the learning of your child. In all of the above, the answer is outsource, outsource, outsource. Many, many resources are available to teach your child subject matter without actually mastering it yourself. With my independent learner, I often use curriculum that is DVD-based and student-directed for subjects that I feel confident in but don't necessarily want to cover the material again myself. I've also used subscription services when a change of pace or break was needed from the normal curriculum. This also frees up some of my teaching time to work one-on-one with my younger child. If your child really needs someone teaching him directly, many classroom and tutoring options are available. I've typically used in-person classes with co-ops or homeschooling groups for extracurriculars, but I know families that are using them for core subjects. If cost is an issue, consider bartering with another friend (she teaches your kids her specialty and you teach her kids yours) or forming a learning group with other families where you'll have support from other homeschooling parents. Though an expensive option, there are always private tutors available. In most areas, students at least 16 years of age will have no problem gaining admittance to the local community college. Depending on the college and student, younger students may also enroll. It might be a good option for some of the more difficult subjects and will also give the student a taste of college. Also, in some states, homeschooling students are able to take AP (Advanced Placement) courses at the local high school. For example, in Michigan, homeschooling students are allowed to participate in non-core classes at the public school. AP courses are considered electives and a fall under this category. While it may not provide flexible scheduling options and require a bit of hoop jumping depending on how well your district works with homeschoolers, it may be the most economical option (free use of your tax dollars) available. Check your state laws to see if this is an option. Also, in our area many private schools are now targeting the homeschooling community and offering part time options and individual classes for homeschooling students. However, my favorite outsourcing option is online classes. For my family, online classes provide the rigor, accountability, schedule flexibility, and teacher support needed for the most difficult subjects. I've used online classes for subjects that I had the ability to teach, but wanted to focus on teaching other subjects and also for those subjects that I had no desire to learn and no background to draw from (e.g. Latin). Many consider online courses too expensive, but I've found them to be very affordable considering my time and other options. Teaching advanced subjects seems to be one of the biggest obstacles to homeschooling through the high school years. I believe it to be one of the largest contributors to the drop in numbers of homeschooling high schoolers. I consider homeschooling parents learning facilitators. They don't have to know it all. They can't know it all. What is important is that you are willing to help your child learn, whether you do the teaching yourself or find other resources for the job. With the variety of options now available to homeschoolers, teaching advanced subjects should not be a deterrent to continue homeschooling through high school if it is otherwise the right choice for your family. Money management skills are essential for success in adulthood. Unfortunately, given the current financial situation of many, I don't believe the last generation of parents provided the level of training necessary. Often times parents don't have the skills themselves to pass on, having grown up in an instant gratification society of credit cards and materialization. Many are hoping that the upcoming generation will be wiser with their money. The best way to teach money management to your kids is to actually have them manage money! Wild concept, huh? Allowance is one way to accomplish this, but how can parents take money management to the next step to better prepare kids to manage money as adults? FamilyMint is an online training tool for kids to gain financial knowledge for the future. Jeff Eusebio, co-founder and CEO, came up with the idea FamilyMint after being unable to find an existing product to help financially train his own 5 children. Bob Masterson, who has 8 children of his own, also saw the need for such a product and quickly joined Eusebio's efforts. You can read more about the impressive background of the FamilyMint founders and advisors here. Getting started with a basic FamilyMint account is both FREE and easy! With the parent acting as the online banker, kids can make deposits, request withdrawals, and set long and short-term savings goals under their account. The interface for kids allows them to visually see how much money they have in their account and progress made toward their goals. Kids can even pull in their own graphics to represent each goal. While the kids can independently log in to their account and make decisions on how they would like to allocate their finances, each decision needs to be approved by the parent banker. The parent has their own interfac e showing the activity of each student account and can either accept or deny the requested activity. Parents also have the ability to set up automated deposits for allowance, set interest rates, or provide matching deposits. 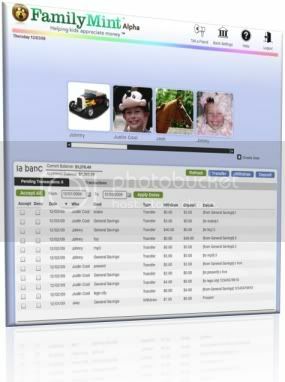 The parent banker has flexible tools and features available to customize the learning experience for his or her family. The parent physically manages the cash for each child, rather than the kids stashing their savings in piggy banks and sock drawers. When the child has an approved deposit or withdrawal, they come to the parent for the exchange. Initially, I wasn't sure how we would use this product in our home. My primary obstacle was that we don't give allowance and my children both have real bank accounts. Additionally, my kids are decent savers and I wasn't sure whether or not they would actually learn anything with this tool nor enjoy doing it. They have both been successfully managing money they've received for birthdays and holidays or odd jobs around the neighborhood. While my kids do have bank accounts, we typically do not let them withdraw from their accounts. Instead, we consider their accounts long-term savings. What I decided to do is use FamilyMint as a way to manage cash before it hits their real account, as well as use it as a visual of the total amount of money each has saved. For each child, I set up a long-term savings that reflected their real bank accounts. This was helpful to both of them, because they did not have access to look up this information automatically except for paper records. Next, I set up the General Savings account as the total cash they had at home. We didn't set any large long-term goals, since the purpose of their real bank account is for college, a car, or larger purchases in the future. The last category I set up was for charity. Because my kids are 10 and 13, I felt it best that they physically keep track of their money rather than have me hold it for them, distributing and collecting. They had been keeping their cash here and there - wallets, lock-boxes, on the dresser. To help them manage better, I gave them each a jar and had them gather up all of their money. The jars are kept in a kitchen cupboard accessible to them. They are responsible enough to not take money from their jars for spending without permission. If they wanted some pocket money for their wallets, they either requested that amount as a withdrawal on the FamilyMint account and took it from the jar when approved or withheld that amount from their next deposit. To my surprise, both of my kids were excited to get going with FamilyMint. I quickly showed them the ropes and explained how to set up their own goals. Then the learning began. My son's first goal was for a $400 Lego set. As much as I didn't think that was a good idea, I rolled with it. After deciding what he wanted to contribute weekly and entering that amount into the system, we were able to talk about how long it would take to save the whole amount using the program. Kids can also enter a date they would like to have completed their goal and the program will let them know how much they need to save each week. A few days later we discussed value. How many smaller Lego sets could he purchase for the same amount? Was there something else he'd rather have than more Legos? We talked about how that amount of money could actually purchase a Wii or other larger item. It didn't take him long to reconsider whether or not his was a wise purchase. He still has the goal on his account, but is not contributing as much weekly and instead focusing on smaller goals. My daughter has a regular dog walking job with a neighbor and always has cash on hand to manage. Typically, she spends very little of her earnings. However, she's been wanting a particular game for the Wii and set that up as her first goal. Then, realizing that this is a game that her brother would enjoy, she quickly convinced him that they could both enjoy the game sooner if they combined their efforts (smiles). It didn't take much to get him on board. I loved that they were working toward a goal together on something that they would both enjoy. During the process, they had been telling me they were close to meeting their goal and that I'd need to order from Amazon soon. However, when they arrived at the magic purchase price amount, a funny thing happened. They asked if I would first get the game from the library to make sure they really liked the game enough to purchase. They wanted to spend their money wisely. What I loved about FamilyMint is it made my kids think more about money. They both already had a good foundation of money management. Neither are big spenders and both like to earn. However, they didn't have a good big picture of the overall process. The FamilyMint interface allowed them to take something that was still a bit abstract in the large scope of things and pull it all together. Give FamilyMint a try and see how it works for your family. Basic accounts are FREE with a Pro version coming soon. Each Crew member used this website a little differently according to the needs of their family, so be sure to check out the other TOS Crew reviews. Last year, I had the pleasure of doing a review of a lapbook from Home School in the Woods. If you use lapbooks in your homeschool or are interested in learning more, you can read that review here. This year, Home School in the Woods sent the Crew two new products in their line, Olde World Style World Maps and Olde World Style United States Maps. Both of these products were created in response to requests from customers to make available a product that contained the Olde World Style maps from their popular Record of Time timeline notebook. Not only did Home School in the Woods comply with the requests, but they added more maps and supplemental pages to the existing collection. Olde World Style World Maps includes over 130 maps, both ancient and modern. The ancient maps show physical characteristics (e.g. mountain ranges), but no political borders. The modern maps show political boundaries representative of today. The maps are available in three formats: with labels, without labels, and without labels and title. While all of the modern maps, with distinct time periods, have a labeled option, some of the ancient maps instead have numerous maps that span an empire. The Olde World Style World Maps also includes 40 bonus notebooking pages. There is quite a variety, from report and essay, fill-in-the blank, and fact pages to creative writing, recipe card and newsletter pages. Olde World Style United States Maps includes over 180 maps. The maps formats are similar to the Olde World Style World Maps set, with several map versions for each state and a set of bonus maps. Maps that show the growth of the U.S. over time, the division of Confederate and Union states and location of Native American Tribes are all included in the bonus section. Two notebook pages for each state are included in the package. Students can fill in various facts about the state, such as the capital city, date of entry to the union and state bird, or they can print a fact sheet that already has the answers. If you would like to see a sampler of each set, please click on the links below. With the variety of map formats and notebooking pages, this really is a versatile set of maps. In addition to history studies, this map collection would be an excellent addition as part of a research project, state unit study, or geography learning. I have to say, being a visual person, I really like the style of the maps and the extra detail put in them. Our history studies have been rather sporadic the last few years, unfortunately. In the past when we've been more focused, I tended to pull out maps a bit more. Next year we are going to have a more focused study on U.S. History and I'm looking forward to putting these maps to use in our studies. Though I'm not a notebooker, I especially liked some of the creative notebooking pages included with the World Map set. Some of these pages, such as the travel brochure template, would have been great when my homeschooling support group had a geography fair that required the kids to set up a display and present to the other kids. Both the Olde World Style World Maps and the United States Maps are available as a download for $18.95 or on CD for $19.95. You can also get both sets as a combo pack for $28.95 as a download or $29.95 on CD. Visit Homeschool in the Woods to purchase or browse the many other history products available. I often hear homeschooling moms mention that they'd love to go to a convention, but they just aren't able to get away to do so. Whether you have little ones underfoot, a super busy schedule or just can't afford fees and traveling expenses, there is an excellent alternative for you! The Schoolhouse Expo, coming up May 12-14, is currently registering. Enjoy speakers from the comfort of your own home with this online homeschooling conference. Can't make a session? No problem - audio downloads will be available for you to listen at your own convenience. Discounted tickets are available for preregistrants through March 31st. TOS gifted me with admission to share the news with you, so perhaps I'll see you there! While you are at it, check out the March Madness sale currently going on at the Schoolhouse Store. 9. I can live without chai, but it isn't any fun. 8. Sunshine is good for the mood. 7. When frustrated, change it up. 6. The perfect place for a trampoline is in front of the TV. 5. 70 pound boys are great back-crackers. 4. Cheerleaders should not be allowed in exercise DVDs. 3. Exercise is more tolerable with an ipod. 1. Regular moms are my inspiration. Thanks Fit Mommies! It has been another semi-successful Fit Mommy week. I haven't been focusing on nutrition too much lately. My goals are pretty much to eat in moderation and not pig out! One day this week I was rummaging the cupboard and found a chocolate left over from Valentine's Day. It looked so lonely, in the heart-shaped box all by itself. CHOMP! There. All better. The only reason it survived this long is because I keep all the snacks and candy in the highest cupboard, which is almost out of my reach entirely. If I really want to see what is in there, I need a chair to view all the way to the back where stuff often ends up. It was definitely a "chair day". I gave up my sugary chai for a few days. Unfortunately, it was because I ran out, not because of my awesome will power! I literally purchase this stuff 10 pounds at a time in three flavors. My supply (vanilla) and my daughter's supply (chocolate) have been diminished, but the hubby still has some of his (spiced). I've been drinking spiced until I can get some more on order. Did it surprise you that chocolate isn't my favorite? It is my preference, over ice, when the weather is warmer. We've had a warm spell here and I'll need that chocolate chai soon. I've really been enjoying the recent sunshine and temperatures in the 60s. Since I tend to eat when it is dark and dreary, I'm looking forward to warmer days to help with the Fit Mommy process. I've really had a boost this week from the weather. Snow is expected this weekend. I better get all of the snacks out of the house! So, the battle of will power and the call of snacks continues in my home. My hope is that I'm offsetting my failings with my workouts. I decided I needed a change of pace in my workouts. Really, wishing the job of poo duty on your virtual trainer can't be healthy, can it? So, I decided to move the Neekdak trampoline from the school room to the basement in front of our large screen TV. My husband was really opposed to this idea (we call the basement the "Man Cave" for a reason), but I promised I would keep it moved to the side when not in use. I actually caught one of the kids bouncing away on it while watching TV. It might actually get more use in its new location. Remember the Urban Rebounder craze several years ago? I have several DVDs of rebounder workouts. I'm happy to say that I worked out four times this week! I feel really good about this. Though I'm using the Basic Workout (the DVD has several levels), it is a harder workout than the one I've been doing on the Wii. Each workout is about 30 minutes long with constant movement, unlike the Wii which has pauses between every activity. There are five sections: warm-up, cardio, sports, cool-down and abs. The cardio is the hardest for me at the moment, with abs (ouch!) a close second. Lest you think my dislike for trainers is limited to virtual ones, do not be fooled! Actually, the male trainer in this video does not get on my nerves nearly as much as the person doing the exercises behind him, and she doesn't even say a word! Ok - so I'm jealous of her perfect body, but that isn't really my problem. The other two women are extremely fit as well. However, she is just entirely too perky. I'm positive she either is or was a cheerleader. How do I know this? She has those sharp and distinct movements and does that head thing throughout the DVD. You know, that little head jerk to the side cheerleaders do after each movement? What kills me is she does it during the stretches too! At the end of the stretch she smiles wide and jerks her head to finish it off. Drives. Me. Crazy. I decided I needed a distraction to focus my brain on while working out. I'm sure Cheerleader Lady is really a very nice person, but I was spending too much negative mental energy on her. So, I got out the best tuning out device I know - an iPod. 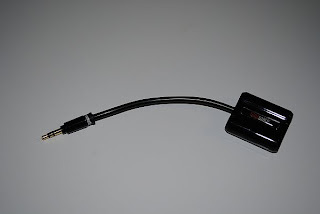 (I wrote about the effects of this little device earlier in the week). Actually, it was an old MP3 player. The only thing on it was CS Lewis' Mere Christianity. So, I listened to Lewis' logical explanation of Christianity while bouncing on a trampoline in sync with Cheerleader Lady. While I love CS Lewis, it was a bit too heavy of material to really pay attention to while bouncing around. I'll find something a little less involved, either an entertaining story or some energizing music, for next week. But for this week, it saved my sanity and it made my workouts go much, much faster. However, I would love find a workout that has normal people in it. Real people. People who actually sweat and have belly fat jiggling with every move. It would be so much more inspiring. This is why I love Fit Mommy. You are all real moms. While some of you are farther down the fitness path than I am, I know you are regular homeschooling moms and what you are doing is not outside of my grasp. And for those of you doing less, it keeps me going too. I think, "They are still in the game. They are not giving up. They have bad weeks too." It is just the boost I need to get back on the wagon. The History Channel is offering an America: The Story of US DVD for free, shipping included, to every school in the United States - homeschools included! This 12-hour, 6-week series will premiere on The History Channel April 25, 9 pm/8c. Requests for the DVD must be made by July 1, 2010 and DVDs will ship out in August. Fill out a request form to get on the mailing list. 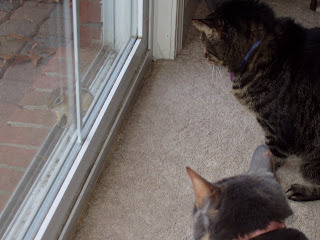 I think this chipmunk was having fun with my cats; it hung out at that spot for a long time! My family has been acting strangely lately. My son can't seem to walk properly, but rather bounces around in a way that almost looks like dancing. My daughter stares at walls immersed in imaginary tales. And the most concerning – my husband spends every evening before bed sporadically laughing and gasping, with his eyes fixated on nothing. Just what is going on in my family? What has control of my family? Is it some evil force, leaving only one person in the household with awareness of others? I had no clue that my life would be like a 3-month episode of the Twilight Zone when I lovingly selected Christmas gifts for my family. ...the powerful little device that allows you to tune out the world, mothers and wives included. Every time I'm in the mood for conversation, it requires walking in the path of a dancing boy, interrupting a really good story, or waiting patiently for a convenient pause in the commentary of a podcast, with my husband's finger held up. It is the wait-just-a-minute index finger to which I refer! For a few brief seconds, the trance is broken. My question or comment is addressed in as few syllables possible, only to have the attention from each family member quickly redirected to secret information delivered by white wire once again. I was starting to feel a bit lonely. I tried talking to the dogs. While I appreciated the intent listening, it wasn't quite the same. The cats might have as well had their own iPod. Cats are woman's best friend only if she has catnip. I decided I was going to beat this hostile takeover. My strategy was perfect. I had devised a plan to bypass the enemy and deliver my message directly to the prisoners, successfully breaking them from their trance. It was a bit risky; I was going to deliver my message, using the enemy's own communication powers. I was going to make my own podcast. Daily downloads of important stuff you need to know if you are a part of this family. It was truly the perfect plan and the last chance to save my family. Then one of the prisoners broke out of their trance just long enough to deliver a message, holding a strange object in their hand. I'll make a podcast another day. Time: Always available, but never enough! This week's Blog Cruise question is, "How do you find time for everything?" Time management has been my biggest obstacle to homeschooling. I cannot meet my own perfectionist goals of having an immaculate house, well-educated children, and ample time for myself - all in a stress-free environment. I'll admit, much of my problem is self-created. There are just too many wonderful opportunities for homeschoolers. When my kids were younger, I embraced learning by doing. We did awesome field trips and I enrolled them in fun and unusual classes. They played sports, danced on competition teams, and joined clubs. I started a homeschool support group with friends. It seemed like we were never home. We weren't. It worked for a time. Frankly, it was exhausting. The only time I had for myself was during a monthly kid exchange I had with a friend. One day a month I'd take her kids for 3 hours and another day she'd take mine. It was blissful 3 hours, but was often spent doing housework. After a few years of this, I quickly burnt out. I used to think that when my kids were older, time would be more easily managed. I was wrong. Some areas have become more manageable, but others have not. While the household work has increased because we've added four furry members to our household, I also have two older children that can help more. As far as time for myself, that has improved because my children are old enough to leave at home if I need to get out. However, the academic workload is heavier and there is even MORE available to them now that they are older, usually with more involvement. A theater production for a 6-year-old that involves only a few lines is a much less commitment than one that involves hundreds of lines for an older child. Also, I've noticed that others are more inclined to ask for involvement of my older children in various activities, partly because there seem to be less older kids homeschooling and partly because older kids are simply more able. Can they be on this team? Would they write an article for a newsletter? Would they like to be a mother's helper for a day? Can they participate in a learning group? Now that I have a tween and teen, our time is guarded more carefully. While I'm nowhere near mastering time management, I have improved. If I weren't homeschooling, I'd have plenty of time to clean house and have tea with friends. Therefore, my focus in answering this question is to how to better manage the time involved in homeschooling activities. I'm not going to give tips on better organizing your housekeeping. Kids can get educated in a dirty house (smiles). For activities outside of the home, I have two simple steps. 1) Learn to say no, even to great opportunities. 2) Carefully evaluate each and every opportunity before committing. Have you ever been guilted into doing something? I have. Or maybe it was something that you really wanted to help with, but realistically you'd have to give up something more important in order to do it. What about that non-defined project that you knew had the potential to grow and grow into something much larger than the original request? In all of these cases, I've learned the artful skill of politely saying no. I've also had to do this on my kids' behalf. Their time is just as valuable as mine. What if you don't *want* to say "no"? This is my biggest problem. It all sounds great, if I could just squeeze it in. I've gotten myself into trouble so many times by not saying no, just because I didn't want to say no. If it is an activity that you really, really want to do, but just don't know if you have the time, you need to analyze the pros and cons. This term was coined by a friend of mine. The Wow Factor is the amount of Wow (as in "Wow, Mom! This is great") you get in proportion to what you give up. Your kids may enjoy that 3-hour program 50 miles away that leaves your wallet $25 less, but perhaps you'd get more "Wow" from an hour of free play at the local park or a playdate with a friend. Which one is time best spent? Oh, how important this is with the current economy! Just as time, most of us have a limited amount of money to use. Are there less expensive activities that will accomplish the same end result? What activities would you have to give up if you participated in this one? When my kids ask to do an ongoing activity, I ask them if there is something they'd be willing to give up in exchange. If it is a one-time activity, I ask if they'd be willing to pay for all or part. This also helps me gauge how badly they really want to do an activity. If they are willing to give up something else or pay for part, I know it is high on their list (and a high Wow Factor). Carefully evaluate the time involved to get an accurate picture. It may seem an obvious answer, but I have misjudged this many times. For years, I didn't properly evaluate the time involved in doing an activity. Sure, the program was only an hour. However, it took 20 minutes to get the kids out of the house, 1 hour drive time round-trip, 15 minutes for an unexpected conversation on the way out and 30 minutes to get the kids refocused upon returning home. My one hour commitment quickly turned into a 3+ hour commitment, which added stress to the day if not properly accounted for. 4) Does this activity fulfill a particular need? I used to sign my kids up for activities just because they sounded fun or their friends were going. I'm much more selective now and look at how they fit into the big picture. Even better, I try to better define the needs of each child at the beginning of they year before activities and opportunities start up. Each year may be different, whether it be music lessons, sports involvement, or simply more unscheduled time. Regardless, it gives me a more focused approach in deciding whether an activity is something we decided to set aside time for. 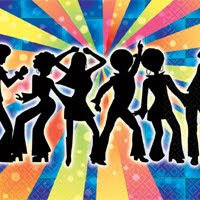 If possible, I look for activities that fulfill several needs. Theater has been one area that has fallen into this category. For my quieter child, it has provided a chance for public speaking and self-confidence. For my more rambunctious child, it has been more of an outlet. For both, it provides time with friends and opportunity working as a team. Is this a once-in-a-lifetime opportunity or can it easily be recreated another time? Many times I have jumped at an activity because I knew it was now or never. While it may have not been a convenient time, I was glad for my kids to experience the opportunity. However, if this is a program or class offered often, or it is something that you could easily coordinate on your own another time, it might be better to pass. Activities that benefit both of my children rank higher. My children both participated in First Lego League this year and gained a lot from it in very different ways. What was important is it was time well spent for both of them. If an activity does not benefit the majority, yet takes time away from others, be extra cautious. Is there a way that those not benefiting can be productive at the same time? For example, can you do school work with the child not participating while you wait during the activity? Is there an activity available for the other child that runs concurrently? You'll not only need to consider the time of the child participating, but those not as well. 7) What other commitments will suffer? Being stretched too thin is never a good thing. Too many times I have agreed to something because we could fit it in, but it was not without something else suffering in the end. Will academics suffer? Practice time for a sport or instrument be cut short? Or will you be cutting out much needed down time? I can't afford to commit to activities on a whim, so the above works well for me. After using the above analysis, there are many times that I've passed on items that I know my kids would have really enjoyed. I've also committed to things that I would have otherwise not considered as heavily because of the time involved. Also, because I am more selective with activities, there are openings in our schedule to consider unexpected events when great opportunities come along. As an example, my daughter had opportunity to participate in a theater production this fall with a professional theater company. It was a huge time commitment, but making the decision was easier by going through these steps. 2) Finances - The major expense was gas money with a 60-mile round-trip, 3-4 times a week. 6) Who Benefits? Since there was only one part, only one child benefited. I then had to move to what that child not participating would need to give up. In this case, it worked to our benefit for the most part. I dragged along schoolwork and some very productive time was spent in the library just around the corner from rehearsals. Plus, but had potential to be a con if it weren't for the available library. As you can see, the pros outweighed the cons in this case, even though the cons were very big cons. I'm late. I'm late. For a very important date. No time to say "Hello." Goodbye. I don't have it perfected yet and still over-commit myself, but I am getting better at choosing the best activities for my children. Now if I could just get the house cleaned and have time for tea with a friend on a regular basis! I was sort of missing in action last week for Fit Mommy. How appropriate, since the action has been missing lately. Sigh. I've been on a decline and it hasn't been with my weight. 10. My family reads my Fit Mommy posts. 9. My family thinks I'm saner than I really am. 8. Husbands doing disco moves when watching wives work out must be universal. 7. I have an unhealthy animosity toward virtual trainers. 6. I ache if I *don't* workout. 5. Horizontal stripes are a good thing. 4. Homemade cookies...not a good thing. 3. Warmer weather curbs my appetite. 2. I don't care about will power, I don't even *want* to resist chocolate covered pretzels! 1. I might just have to break into a run to catch up to the wagon again. Last week actually didn't start off too bad. I worked out three of the four days that I had planned on. I wasn't feeling well early in the week, but I still worked out. Yay me! At one point my husband came up and started doing some strange Saturday Night Fever moves in an effort to mock my awesome workout action. What is up with that? Then, I remembered Mrs. White commenting that Mr. White has been known to go into some funky moves when she works out. Do all husbands do this? At the end of the week, I got bogged down in schedule and attitude. I was tired and cranky and just wasn't up to working out. Unfortunately, it carried through to this entire week. I didn't work out once. The closest I came was hauling about 7 bags of doggy doo-doo to the curb after cleaning up our yard that looked a poop bomb went off after the snow all melted. I'd much rather deal with the dreaded virtual trainer for a workout than haul poo. Actually, I'd much prefer if the virtual trainer did poop duty. I could sit on the deck and encourage her with, "Way to go! You can do it!" One thing I noticed this week is I'm actually aching more having *not* worked out. My knee has been stiff and my muscles sore. They hurt more than when I have a really good workout. It is motivation to get going again. I'm tired of the slow progress though. I saw an advertisement in a local publication that said their workouts burn 800 calories each time. Sigh. That is about 8 workouts for me! A bit discouraging. My husband made up for it by mentioning a new shirt looked nice on me (Thanks, hon! Love you!). Note to self: Get more shirts with horizontal stripes. Nutritionally hasn't been much better, but not awful either. I've tried to remember my vitamins and have been drinking cherry juice regularly (something I've done in the past, but have stopped for awhile.) The weather has been nice and warm, relatively speaking, and I've wanted to pig out less. I had some slip ups though. I made some homemade chocolate (of course) chip cookies for a potluck, but made a DOUBLE batch so we'd have some at home too. That probably wasn't the best idea. Then today my husband brought home some absolutely delicious chocolate-covered pretzels, complete with gooey caramel, marshmallows, and other bad-for-you-but-tastes-so-good toppings. Fit Mommy? What's Fit Mommy? I'll take two! The sprint I'll need to break into to catch up with the Fit Mommy wagon next week will do me some good. 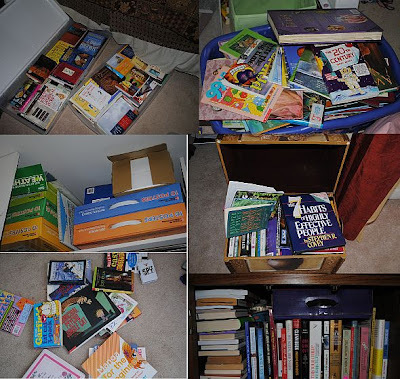 This week's Blog Cruise question is, "How do you organize your homeschool space?" Organization is not a skill that comes easily to me, at least not in a way that is recognizable to most. I'm a stacker and a stasher, though I usually know what is in every pile. However, I realized early on that I needed to be more organized for our homeschool materials. I once forgot to do a certain subject for over a month because I misplaced a book - and didn't realize it was missing. I needed to change my ways before the kids figured out to start hiding math books! Things have to be in front of my face for me to remember them. Otherwise, I simply forget. But with so many books in the house, I needed a system to keep those most important in front of me at all times. I have been completely blessed with a bonus room above our garage that we converted to a homeschooling room several years ago. 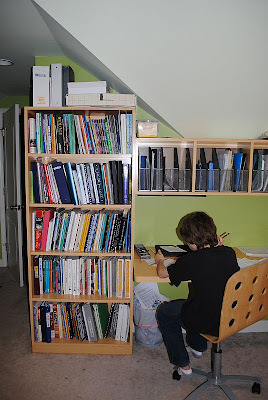 I keep our most frequently used homeschooling materials on this shelf, which is connected to a long desk with cubbies up above. These are materials that I don't use daily, or perhaps not even yearly, but that I like to keep in the front of my mind as a potential resource when I'm looking for something new. The desk runs down a narrow part of the odd-sized shaped room. The left side is where the kids do their assignments that don't require a computer, which sits on the right. 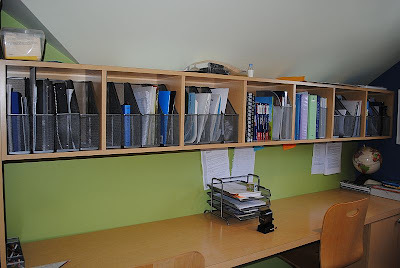 The right side cubbies hold reference materials and computer software. In the cubbies on the left, I have a box for each subject in a sort of modified workbox system. When I'm planning for the next day, I'll add any materials (such as a game, flash cards, ect.) that are needed for that subject into the box. For the subjects that we are going to do that day, I turn the box with the open end out. When it is completed, it is turned around to show the enclosed side.This system has worked out beautifully. Everything is visually in front of me to help plan the day. 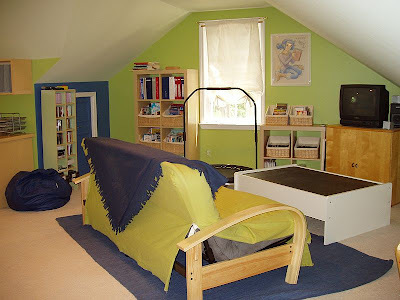 The rest of the room holds a couch, a trampoline, TV for watching DVDS, a shelf with several cores of Sonlight materials, educational DVDs and CDs and a converted train table with a blackboard top that contains board games. Lastly, we can't forget Lego City. 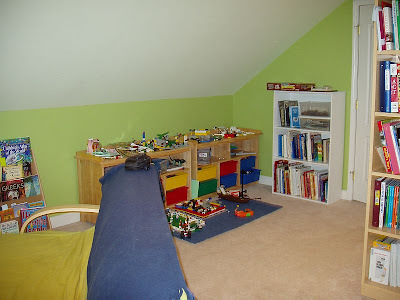 Usually the Legos are taking over the whole room. I really should take a more accurate picture. The book shelf in this picture holds more school and reference materials that aren't used that often. With so many books in the house, library books have been a problem. 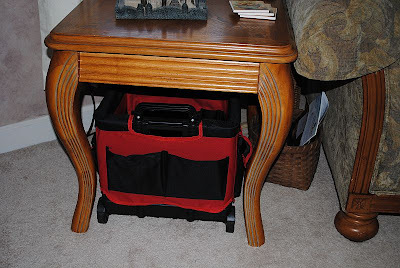 To minimize library books getting lost, I have a rolling cart that sits under an end table in our family room. 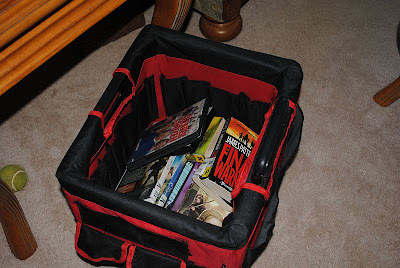 When it is time to go to the library, I simply roll the cart out and take it with me. The kids load up the cart and we roll on out of there. My kids are responsible for any late fees or replacement charges, so they are extra careful to make sure the library books get returned to the cart. Now, I realize that this all looks ultra-organized. It is a little deceptive. I have taken those things I use the most and they are rather organized most of the time, though there are usually Legos underfoot at any given moment. However, what I am not showing you is all my stashes and piles of books and educational materials in all corners of the house. I have bookshelves hidden everywhere. Some are books that I need to sort and sell, others are books that I eventually plan to read. Many are plain pleasure reading for the kids. I am a true hoarder of books. The secret to appearing and feeling organized is to hide your stash where you can't see it! 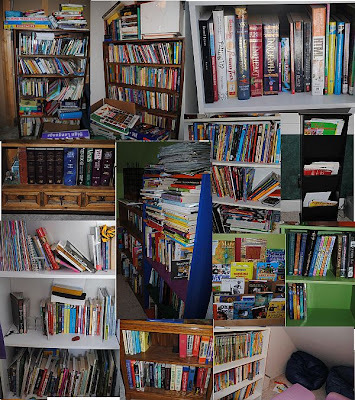 Below are some of our bookshelves, tucked in the basement, the kids' rooms, and closets. Aha - did you notice that empty space on the green shelf? That is only because my daughter is currently organizing her books and has her own piles in her room. That empty space will soon be filled. As most homeschoolers, I've run out of shelves, so I stash books in other places too, like trunks, clothing closet shelves, underbed storage, and armoires. I do know most everything I have and where it is located, so perhaps I'm organized after all. However, it is a fantasy of mine to get one of those book scanners for home use with enough shelves to place every single book I own by the Dewey decimal system. For now, I'll have to make due with the scattered system in my head. 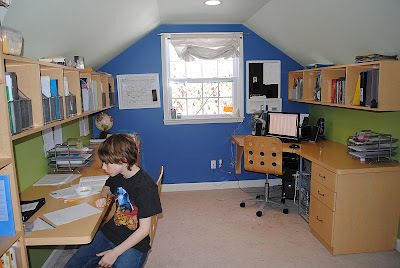 So, how do you organize your homeschooling space? How do you keep track of things? See what others have to say on this week's Blog Cruise. When should you give homeschool grades?